Baldassare Castiglione was the author of The Courtier, the second most influential book to be written in the Renaissance after Machiavelli’s The Prince. The Holy Roman Emperor Charles V kept three books on his bedside table: the Bible, The Prince, and The Courtier. Castiglione goes to Milan for his education and is residing at the court of Ludovico Sforza and Beatrice D'Este (sister to Isabella D'Este the Duchess of Mantova) when the French invasion occurs. Castiglione in Naples fighting at the side of his Duke, Francesco Gonzaga, as Gonzaga fights for the French allies in their battle with the Spaniards for control of the south. Piero de' Medici dies in this battle. Castiglione is invited to come to Urbino by Guidobaldo da Montefeltro, the Duke of Urbino. Guidobaldo has just been welcomed back by the people of Urbino after the fall of the Borgia family empire at the death of Pope Alexander VI in the summer of 1503. Later Castiglione will write his book The Courtier based on the conversations at the court of Urbino in these years of 1503-1506. Among the exalted guests at the court in these years are the two Medici brothers, Giovanni de' Medici and Giuliano de' Medici. They live as honored guests at Urbino during their exile from Florence. An important member of the Urbino circle is the Duchess, Elisabetta Gonzaga, who is the sister of Francesco Gonzaga, the Duke of Mantova. 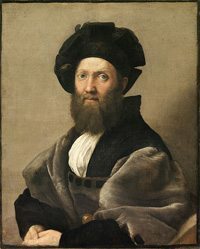 This is an important connection since we should remember that Castiglione's primary source of influence is always his relationship to the ruling family of Mantova – the Gonzagas. Guidobaldo, Duke of Urbino dies. The Duchess is plunged into grief as is the whole court. The death of the duke marks the end of the magical world of Urbino as it is immortalized in Castiglione's book The Courtier. It is a brief moment, 1503-1508, during which Urbino seems to be the most elegant and the most cultured court in all of Europe. It is now in the sad period after the duke's death that Castiglione begins his book. It is a book about a lost world. War in northern Italy as the Pope leads an anti-French coalition. Ferrara is caught in the middle, since it has always maintained a pro-French foreign policy. This attack on Ferrara draws in the Gonzaga family of Mantova. It is the Duchess Isabella's brother who is ruling Ferrara. All the small states of the north worry over any war since they survive only by choosing the right alliance. Mantova is always exposed out in the middle of the Po plain as is its neighbor Ferrara. April. The Battle of Ravenna. The whole map of northern Italy changes again. A definitive confrontation between a huge French army and huge Italian coalition led by Pope Julius. The French win but their victory is so costly that they begin a total withdrawal from northern Italy. August. Congress of Mantova. After the Battle of Ravenna all Italian forces send representatives to Mantova. For a few days, Castiglione's native state is the center of the international diplomatic world. Everyone is there. The Duchess Isabella presides over this important gathering. One decision made at the congress was that the Medici should have Florence back. Thus Spanish troops march south and aid Giovanni and Giuliano de' Medici to take back Florence on the last day of August 1512. The result is that Machiavelli is soon be out of a job and in prison. Giovanni de' Medici is elected Pope Leo X. Castiglione is asked to serve as Ambassador to the Vatican from the Court of Urbino. Castiglione has remained close to his friends at Urbino since the death of the Duke. The Duchess Elisabetta remains there giving advice to the new Duke Francescomaria della Rovere (nephew of the former Pope Julius II) and arranging the marriage of her niece to Francescomaria. The security of the state of Urbino is immediately in danger with the election of Giovanni de' Medici to the papacy. He needs a state for his stateless brother Giuliano and even if the court of Urbino had served as his own refuge during his exile, it is a natural target for papal ambition. The previous pope had eyed Urbino for his own relative. But Pope Julius had been able to arrange its acquisition peacefully with a strategic marriage of his nephew to the sister of the reigning duke. The duke died childless so now in 1513, Francescomaria ruled Urbino. But now his protector, Uncle Julius, was gone and the new pope might just grab Urbino for his own family. Thus the choice of Castiglione as ambassador was the best of all possible choices. It is Castiglione's responsibility to cajole the pope into protecting the court of Urbino. We should remember that Castiglione is an old friend of the Medici brothers. They had all been together in Urbino during those magical years of 1503-1506. For most of the years after 1513, Castiglione was in Rome functioning in various diplomatic roles. By 1520 he was one of the most respected and most trusted Italians in the world of international diplomacy. He had known all the popes and soon came to know the new Holy Roman Emperor, Charles V who was also the King of Spain. January. King Ferdinand of Spain dies and his grandson Charles becomes King of Spain. A new generation is taking over European leadership: Charles, Francis I, and Henry VIII.March. Pope Leo's beloved brother Giuliano dies in the Medici villa in Fiesole. Now the last impediment (Giuliano) to papal designs on Urbino is gone. Giuliano had insisted that the Medici should be loyal and grateful to the house of Urbino that had given them respite in their exile. With Giuliano gone, a less sentimental Pope Leo is ready to pounce on his former friends. June. All the efforts of the Urbino network that included the Estensi in Ferrara and the Gonzaga in Mantova and Castiglione working in Rome fail. Pope Leo X sends papal troops to take Urbino to conquer the small state for his nephew Lorenzo (son of the dead Piero de' Medici). This is the man to whom Machiavelli dedicates The Prince. It is my contention that the book is addressed to Lorenzo as advice on how to rule his new state of Urbino (not Florence). The Duke and Duchess of Urbino run for their lives and are given sanctuary in Mantova by their Gonzaga relatives. Duchess Isabella now has her niece and husband on her hands as the pope hounds them for giving aid to his "enemies." With the Duke and Duchess of Urbino out of their state, their ambassador in Rome is out of a job. Castiglione finally comes home to Casatico and Mantova to renew his lifelong friendship with the Gonzaga and especially with Isabella. Now he sits down to write his book, The Courtier, that he had started many years before. While at home he delights his devoted mother by finally marrying. In his thirty-eighth year Castiglione marries Ippolita Torelli. She is fifteen years old. The marriage is a huge success. Lorenzo de' Medici, the ruler of Urbino dies. Everyone says that the Medici got what they deserved and Pope Leo is sunken into gloom. Many around him say he is being punished and he concludes they are right. Urbino is once again an open question. Giovanni de' Medici, Pope Leo X, dies at the age of 46. Francescomaria della Rovere and his Gonzaga wife return to Urbino as Duke and Duchess and are welcomed with a tumultuous celebration by the Urbinati. After a brief pontificate of the northerner Adrian VI, Giulio de' Medici is elected Pope Clement VII. For the next seven years, Castiglione will be in Rome almost constantly. This duty is very reluctant. He loves his young wife who has given him two children and he is devastated when she dies in childbirth while he is away. He says he will never forgive himself. He feels that he should have not been at her side. But his presence in Rome is necessary for his Mantovan and Urbino friends. He knows all the players and is especially close to the new pope whom he has known since their days together in the magic circle of the palace of Urbino in 1503-1506. He also knows the emperor and soon the pope will ask him to take on the most important diplomatic task facing anyone in all of Europe: service as the Vatican ambassador to the Holy Roman Emperor ruling from Spain. Pope Clement VII signs a treaty of alliance with the French. The emperor in Spain is enraged and poor Castiglione has to absorb his wrath at the perfidious pope. Catiglione is shocked at the pope's action and warns that it will bring on a disaster: that France will not protect the papacy and that imperial troops will ravage Italy. Machiavelli is saying the same thing as he watches the same drama from Florence. Both men warn that Italy is heading for a disaster. Baldassare Castiglione, worn out from his ceaseless activity trying to save his pope from his own stupidity, dies in Toledo. The Emperor, who adored him, gives him a state funeral attended by all the grandees of Spain. His body is laid to rest among the heroes and saints of Castile. Later his remains are returned to Mantova and interred in the family chapel.The Emperor remarked: "I tell you that one of the best gentlemen in the world is dead." Charles kept three books on his stand next to his bed: The Bible, The Prince, and The Courtier.